A white suit worn by John Lennon on the cover of the Beatles' Abbey Road album is to be sold at auction next month. 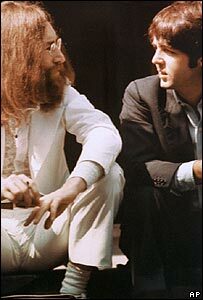 Lennon wore the suit in 1969 for the photograph, which had the band mid-stride on a pedestrian crossing in the London street of the title. US auction house Julien's expects it to reach up to $150,000 (£83,500) in a memorabilia sale closing on 29 October. Also up for sale is a hearse owned by Lennon, which featured in Imagine, the 1973 documentary about the musician. The outfits worn by the band were pored over by Beatles fans at the time of the album's released because of false rumours that Paul McCartney had died. "This iconic white suit fuelled rumours that Lennon represented a clergyman in McCartney's funeral procession," said Laura Woolley, of Julien's Auctions. In reality, the Beatles appeared in the clothes they happened to wear to that day's recording session. Lennon's customised 1956 Austin Princess hearse has a licence plate which reads "Imagine". It is expected to sell for up to $300,000 (£167,000). A portion of the proceeds from the sale of the Lennon items will go to campaign group Amnesty International. Other items for sale include actress Marilyn Monroe's 1961 appointment book, containing her meeting schedule, engagements, phone calls and notes for the year before she died. Her phone book for the years between 1958 and 1961, which boasts the numbers of Elizabeth Taylor and Frank Sinatra, is also for sale. Singin' in the Rain actress Debbie Reynolds has put her friend Elizabeth Taylor's head dress from the 1963 film Cleopatra up for sale. The items will be sold in an online auction, closing on 29 October.